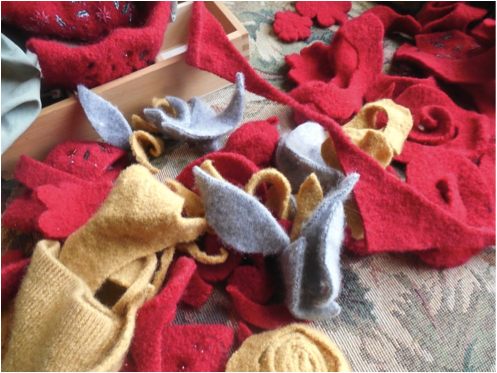 It’s Christmas crafting time! 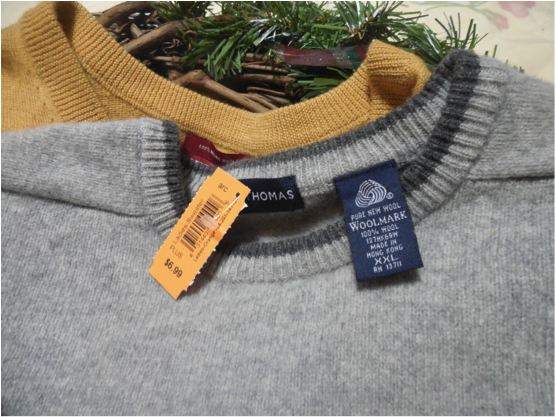 Which means an immediate trip to arc thrift stores. I bought a lot of supplies for a lot of different Christmas crafts. There are already so many holiday items out at the store! 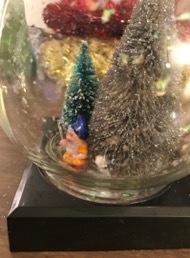 I spotted this interesting glass globe for only $3.49 and immediately thought of a snow globe. I’ve used jars from arc for globes in the past and wanted to try again with this cool piece. 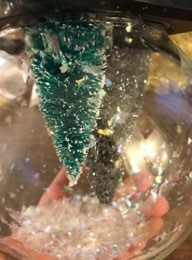 The base unscrews from the glass dome, allowing me to get fun, winter decorations inside. 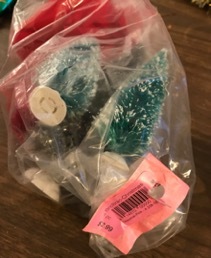 Among all of the Christmas decorations and bags that I purchased, one was this big bag of tiny trees for $2.99. 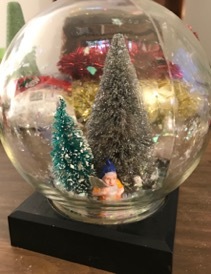 I knew these would be perfect inside the snow globe plus many more of my other planned holiday crafts. 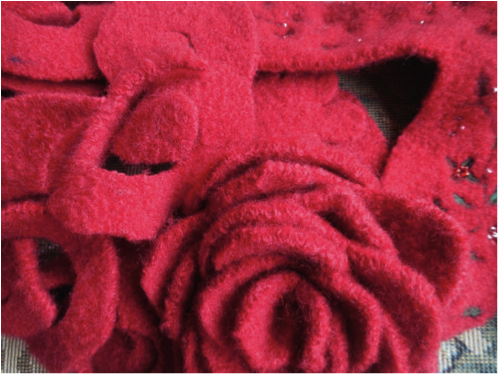 Buying craft supplies at arc thrift is a great money-saver. I always get much more for my money than I do at the large craft stores. I started by hot-gluing two trees from my arc bag onto the base of the globe: a silver glitter tree and a green tree. 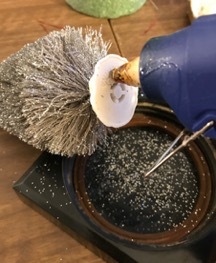 Glitter is a mainstay all over my house during holiday craft season. 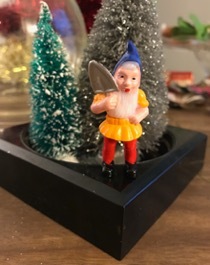 I found a little gnome to go with the trees in my random bits of crafting supplies at home, most of which have been purchased from arc thrift stores in the past. 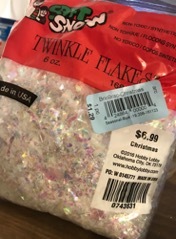 One of the other winter crafting mainstays that I bought at arc was fake snow, another source of Christmas glitter. 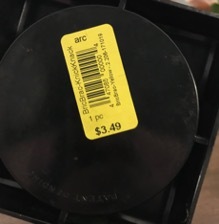 Check out that $1.29 price tag next to the original craft store price of $6.99. Arc prices for the win! I poured some of the snow into the base and then screwed the glass globe on tight. Flipping this guy over distributes the snow and then it’s good to go. 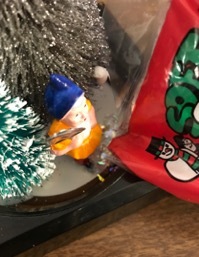 The easiest Christmas craft on earth, the gnome snow globe. Thanks to arc thrift this was a one-stop, low-budget project. A year ago my husband and I bought our country vacation home in Kansas, a dream we have had for years. In just a few short weeks we will be hosting the first large family Christmas gathering in the house. Wanting it to be very festive but on a budget I went to work. I love all things rustic and vintage. In order to save money I looked around the house for things that I have and could use as part of the décor. Then a trip or two to arc Thrift was in order. 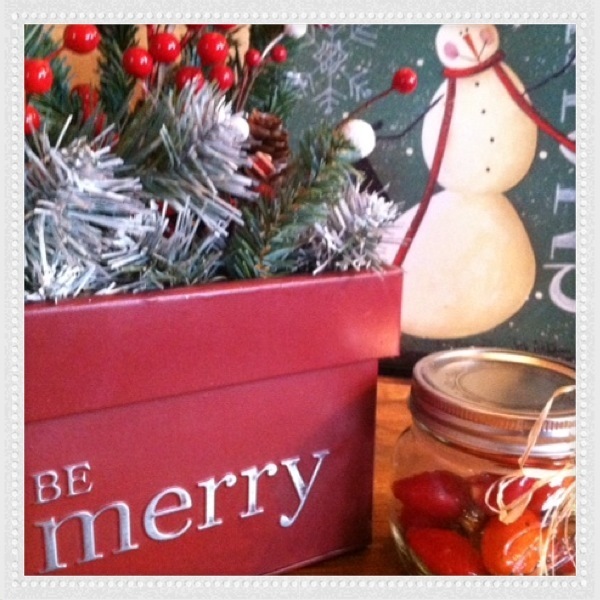 Trying to add a touch of Christmas to every room in the house would be the challenge. 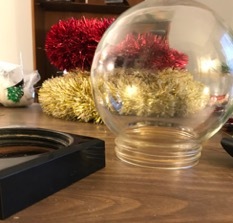 Some of the ordinary things I gathered up included mason jars, cookie cutters, red bandanas, vintage red pyrex pieces, galvanized and metal containers of all sizes and old Christmas light bulbs. 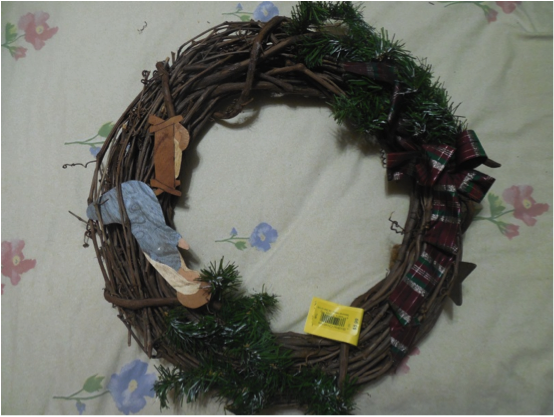 On hand I also had craft paint, raffia, miscellaneous wood letters and an assortment of ribbon and Christmas ornaments. In the kitchen cookie cutters and some gingham check ribbon added a little touch of Christmas to the cabinet handles. Adding red towels also added pop and a Christmas feel. The hutch in the dining room was super fun to pull together. My dinnerware is an assortment of different patterns but all white. It’s so easy to change the look of the table with white as the anchor. I added a few vintage red pyrex serving pieces and bake ware. White hobnail candy dishes, 50’s era Christmas angels and some ornaments gave it a festive look. Using cotton kitchen towels as napkins, placemats or runners is another great way to save a few dollars. 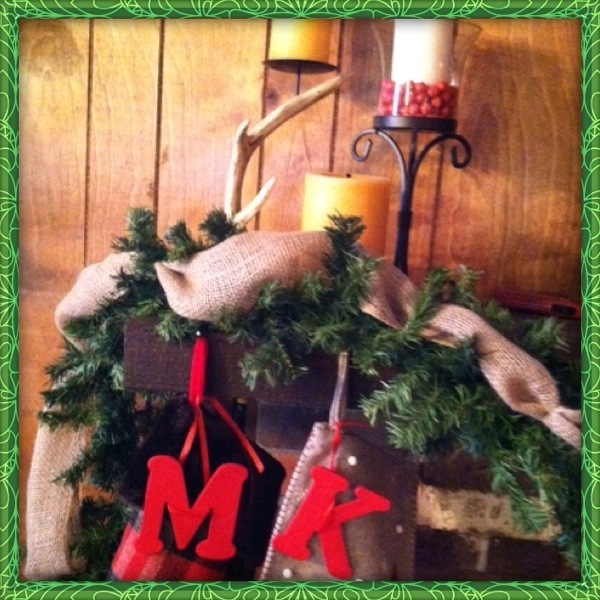 On the mantle candle holders were given a touch of Christmas being surrounded with evergreen garland and burlap ribbon. A red bead garland was taken apart and the beads used in a candle holder for a pop of color. Wooden letters were painted red and tied to the stockings with ribbon to identify which family member the stocking belonged to. Mason jars have been put to use in so many different ways. 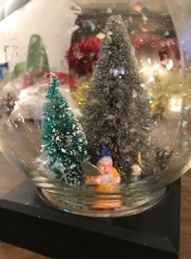 They make cute snow globes using epsom salt as the “snow”. You can fill them with old Christmas light bulbs, ornaments, bells or pine cones. One of my favorite uses is as luminaries. They are beautiful and very sturdy even standing up to wind. 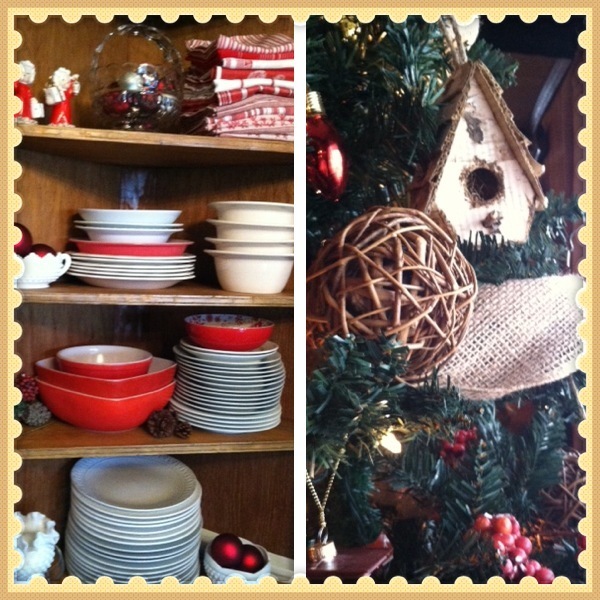 I found so many great things at arc Thrift that helped me create a rustic and vintage Christmas in the country. Merry Christmas everyone! arc is thrilled to introduce our brand new guest blogger, Lian. 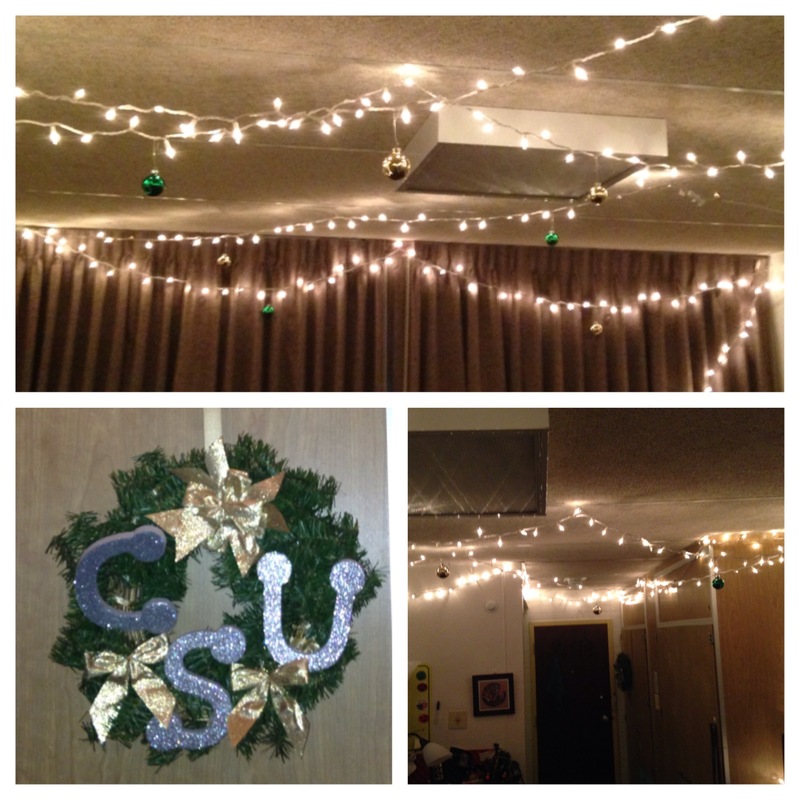 Lian enjoys being thrifty and crafty as a CSU college student. 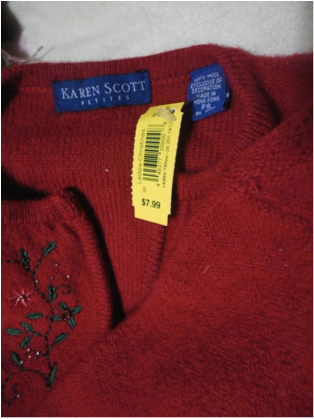 We look forward to many more ideas and great finds from her at arc Thrift Stores. It’s finally December, and do you know means? Well, at least for us college students it means finals and usually stress. There is one consistent way I have found to help make it all more bearable: bringing Christmas cheer to your very own dorm room! 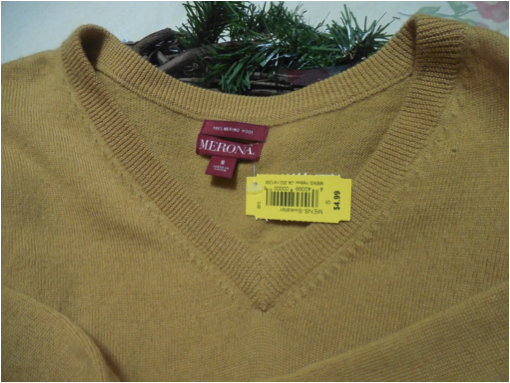 I went over to my local Arc Thrift Store in search of such cheer. 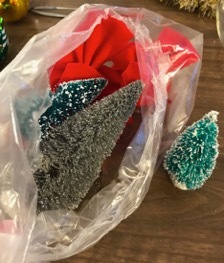 I had some great finds such as Christmas lights, a wreath, Christmas ornaments (CSU colors, of course), some gold bows and some alphabet letters. All of these decorations only cost me $17 dollars! 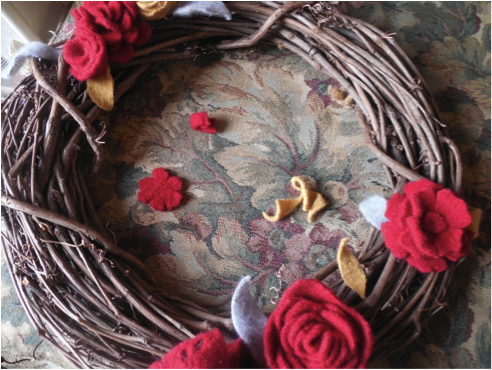 I had a great time crafting this stuff together while listening to Christmas music. 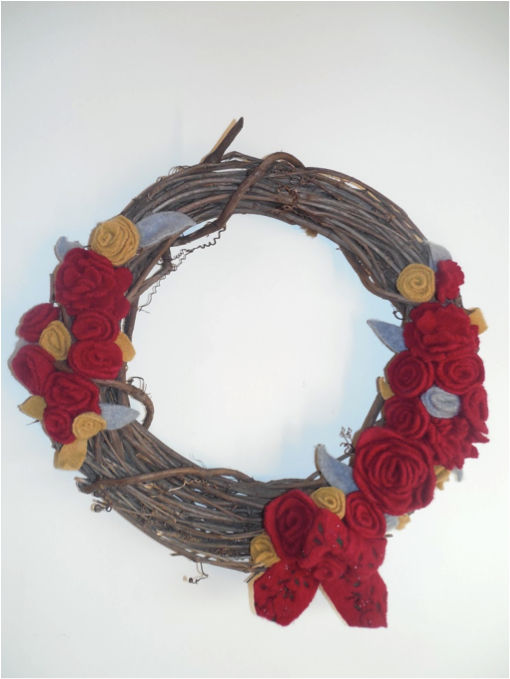 I proceeded to glue on the CSU letters onto my wreath and took the gold bows and glued them on as well; a very simple but festive result! After I finished, I had a grand ole time hanging all of the Christmas lights in a crisscross pattern across my ceiling and staging my homemade wreath on the outside of my door. All of a sudden, my room was now a winter wonderland! Thanks to arc for making this cheery moment possible during a stressful time for a poor college student. Laughter danced through the offices at arc Thrift Stores as team members selected their top choices for the annual white elephant gift guide. Traditionally “White Elephant” gifts are items that are useless, but humorous. For the last 12 months, the marketing team at arc Thrift Stores has been collecting items that fit that bill. Following is a preview of the 2013 “Top Ten” White Elephant gifts that are sure to be a conversation piece. Let the gag gifting begin. Over a million other White Elephant gifts can be found in arc Thrift Stores 22 Colorado locations along with vintage Christmas treasures and “Ugly” Christmas sweaters. About arc Thrift Stores: arc Thrift Stores http://www.arcthrift.org operates 22 thrift stores and 9 “donation stations” throughout Colorado. arc Thrift Stores provides funding to arc Chapters, which in turn provide advocacy for people with developmental disabilities. arc Thrift Stores is one of the largest employers of individuals with developmental disabilities in the state of Colorado.